Breakfast. What do you think of when you see this word? I think of having to wake up early and get out of my comfy, warm bed to eat. Some mornings the internal debate on whether to get out of bed is fierce, but I never miss breakfast. Know why? It’s the most important meal of the day. I know, you’ve heard that since you were a little kid ... because it's true. But it's also true that life is hectic and many of us don’t think we have time to eat breakfast, so it’s also the most skipped meal of the day. That’s not a good idea. According to WebMD.com, eating breakfast can help with weight control and improve physical and mental performance. By eating a healthy breakfast (sorry, but that generally doesn't include doughnuts), you can increase your intake of vitamins and minerals, improve your concentration, lower your cholesterol, become stronger and increase your endurance. I don’t know about you, but I think all of that sounds great! Breakfast doesn’t have to be something big and extravagant; it can be as simple as a bowl of cereal. Here are some other great ideas for quick-and-easy breakfasts: Smoothies Fruit smoothies and green smoothies are great breakfast meals, and they don’t take long to make. 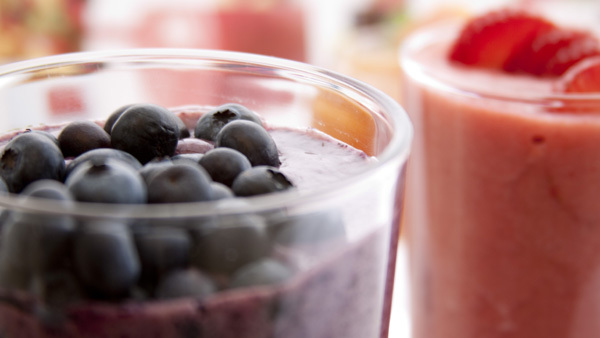 Berry-Banana Blast is a great recipe that you can make in your Blendtec blender and enjoy on the go. Just put all of the ingredients in your FourSide jar, blend and enjoy. Blendtec's Berry Banana Blast Smoothie Breads and Batters Sometimes it helps to prep breakfast the night before. Bread is a great option, and it doesn't get much simpler than our Peanut Butter Bread. Mix the ingredients in your WildSide+ jar, and bake for 50 minutes. You'll feel some extra motivation to jump out of bed the next morning. To up the flavor factor even more, spread a slice of the bread with jam (here's a quick and delicious Strawberry Freezer Jam recipe). You can also make a batter the night before. Blending the batter for Whole Wheat Pancakes takes seconds in your FourSide jar. When the batter is ready, cover it and place it in the fridge for use the next morning. 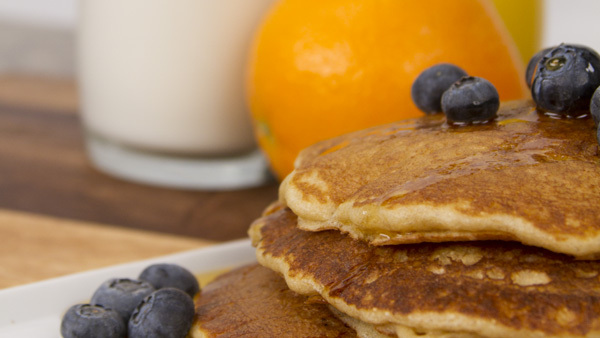 Blendtec's Whole Wheat Pancakes[/caption] While smoothies, breads and batters are great choices for a quick, healthy breakfast, they are just the start. For more ideas, check out our Recipes page. You'll find numerous recipes that are almost as fast to make as grabbing that doughnut—but much more nutritious. By eating breakfast—especially a healthy one—you’ll feel better all day long. What are your favorite breakfast meals?